Hello! Thank you for stopping by my blog. The latest challenge is up at Tuesday Morning Sketches, it's time for our end of month Blank Canvas challenge. We designed these challenge to give you creative license. Use a few things specifically, but you're not confined to a sketch. You're not even confined to a card. Use this on your art journal or mixed media projects. 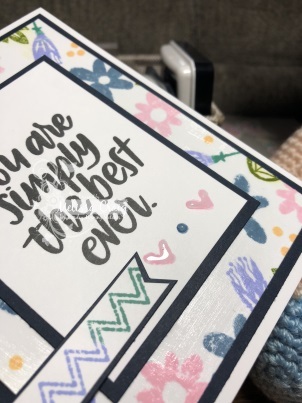 My card was super simple! The requirements are: 1) Feature embossing, heat or dry; 2) a 3D sentiment and 3) summer colors yellow, navy blue and turquoise. You're free to add other colors but these 3 need to be on the project. 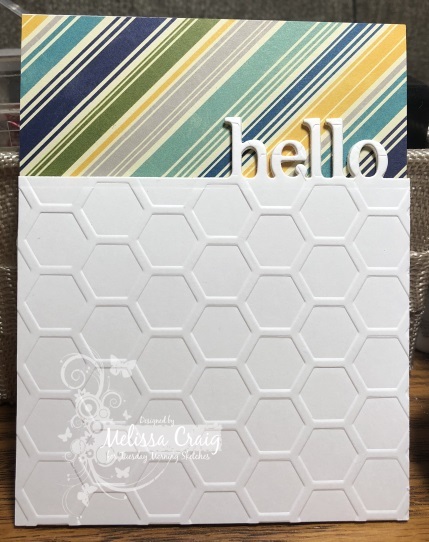 My card features paper from Jillibean Soup, May small die of the month from Spellbinders (which were actually 4 different dies) and an embossing folder from Cuttlebug. This is such a simple notecard and so easily mass produced. I love that I got these dies and can't wait to play with them more. The dies are "hello," "Celebrate," "Thank You" and "Smile." They are designed to fit your A2 sized card both portrait and landscape. To make it 3D I popped up the panel with a slightly smaller than the panel piece of fun foam. I then cut out the sentiment with fun foam so that it perfectly matched. It did require the extra postage for hand-cancelling but nothing is going to get bent. Be sure to visit the design team - they created some pretty fantastic cards! See you at the Tuesday Morning Sketches blog. Hello! Thank you for stopping by. The latest sketch is up at Tuesday Morning Sketches and it's a great sketch by Debbie. It will work for quick and easy cards as well cards you want to spend more time on. My card this week features stamps from the Simon Says Stamp May kit as well as fun and easy technique. My pictures aren't great - it has been rainy and gray for over a week and a half now and it doesn't look like it's changing any time soon. I stamped the flowers using Distress Inks in Spun Sugar, Shaded Lilac, Evergreen Bough, Stormy Sky, Peeled Paint and Dried Marigold. 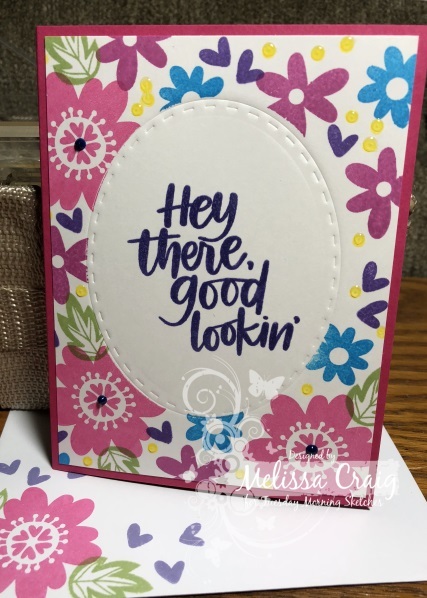 I decided to make my sentiment the focal image and made the banner piece just a little embellishment by stamping with the zig-zag border stamp also in the set. Now the technique I decided to try was to make this look like it was painted. A long time ago and I mean a very long time ago, Stampin' Up! used to have this medium that would go well on paper with a paint brush and you'd see the brushstrokes thus giving it a painted look. So I thought I would try it using Nuvo Crystal Drops - Morning Dew (clear). I painted this one and it worked! Now granted it work better and the effect more pronounced if it was on a very colorful, dark piece. Hopefully you can see the strokes, you kind of can on the bottom part in the picture below. Darn weather! In real life, this looks really cool! I did watercolor a piece last night and applied the same technique, but when I overstamped the image, it didn't line up exactly so it's blurry. I still tried it but I won't show it because it might cause sea-sickness just looking at it. Please come join us at the Tuesday Morning Sketches blog for this fun challenge. Be sure to go visit the design team blogs, too. They made some really awesome cards. Hello! Thank you for stopping by. The latest sketch is up at Tuesday Morning Sketches and it's a super fun one. I love this sketch, I think it has so much possibility. I am super excited to share my card today. I was commissioned to make some favors so I used some of that money to pick up the Essentials by Ellen Mondo Sakura stamp set that was just released at Ellen Hutson. This is the first time I've ever purchased an Essentials by Ellen set. I've been a customer of Ellen Hutson for years, but have never bought her exclusive sets. I am so impressed! The packaging alone is... Wow! It comes in a heavy duty plastic storage pouch. This first one has a little boo-boo but it's hardly noticeable so I'm not going to point out. 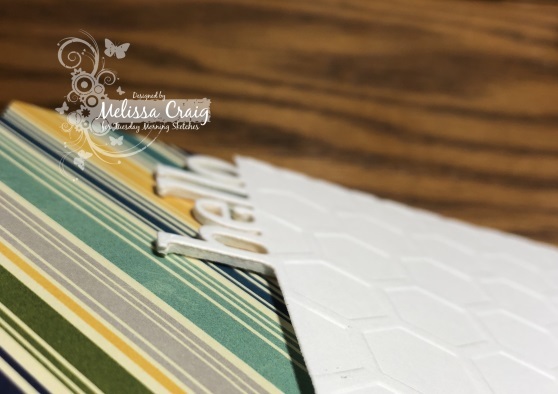 So I started with placing the stamp in the MISTI and stamping with VersaMark and white heat embossing on the Kraft layer. Then I used Momento Tuxedo Black to stamp on the white layer. I colored the images using my Copics. Then once again I put the white layer back in the MISTI and stamped again with VersaFine Black Onyx ink and clear heat embossed. I am telling you! I am a HUGE fan of over-stamping. This just totally tightened up the image and made a beautiful finish. I also like this spotlight technique - I mean this is that technique on a larger scale where I'm covering up more of the line image with the colored image, but it's still so pretty. I finished it off with white heat embossing the sentiment on a black strip. 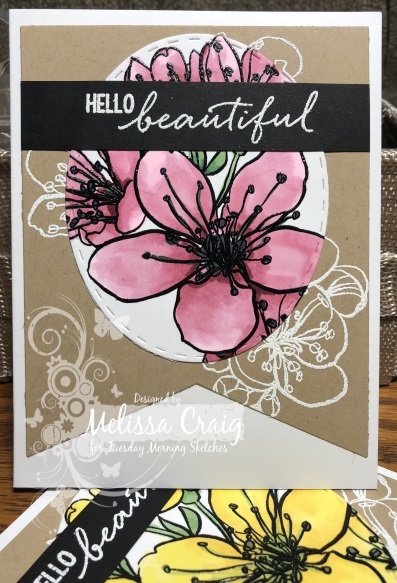 The "beautiful" is from the Mondo Sakura stamp set and the little "hello" is from the Hello Sweet stamp set from Pink & Main. Hello! Thank you for stopping by. The newest sketch is up at Tuesday Morning Sketches and this one is by Debbie. I had a lot of fun with this sketch and I hope you will join us. 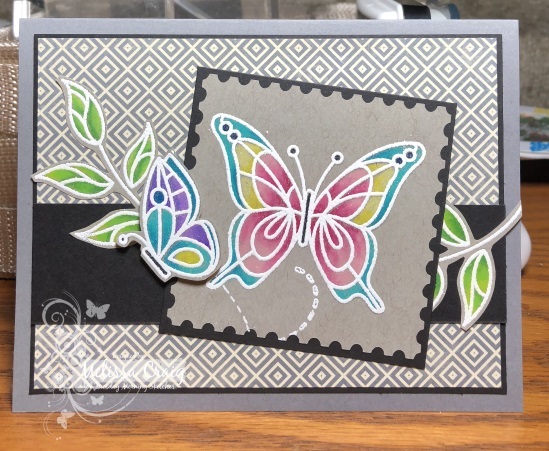 I stamped the images onto this Toned Gray paper using Smoke ink by Simon Says Stamp. Then using my Prismacolor pencils, I colored each of the images. I had used my MISTI to stamp the images to begin with so I left them in my MISTI. 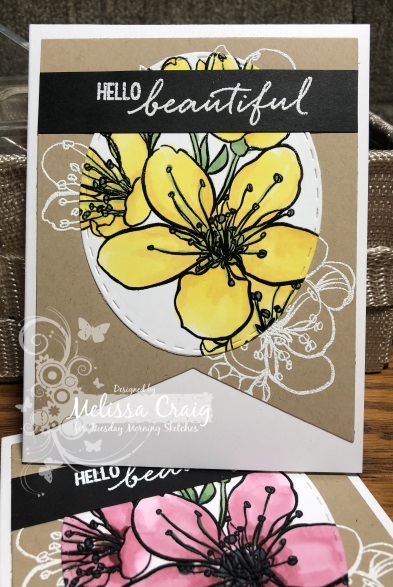 When I was done coloring I put the paper back into the MISTI and over-stamped the images with VersaMark and then added white embossing powder by Nuvo. I fussy cut out the leaves and the little butterfly. I cut the focal butterfly using my Silhouette Portrait. Keeping with the gray color I kept the rest of the card in grays and blacks - this really made the colors pop and command attention. Now be sure to go visit the design team blogs, too. They made some really awesome cards. Believe it or not, I'm actually playing along with a challenge, too. My Time to Craft challenge #370 is coloring on anything but white. Hello! Thank you for stopping by. The newest sketch is up at Tuesday Morning Sketches. It's a lot of fun, with lots of elements that are open to interpretation. The card base is an old In-Color color called Razzleberry. My intent was to keep this card a one layer card, well, a two layer card. I embossed the oval shape in the center and then masked it off. I stamped the flowers from the set in bright colors, using the biggest flowers as the corner elements of the sketch. 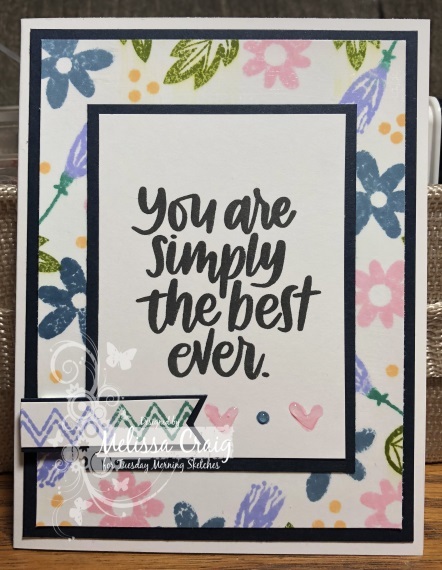 I stamped the sentiment using SSS Wisteria ink and then I over-stamped that with VersaMark ink and heat embossed it with clear embossing powder. I double stamped the Wisteria so it came it really dark and in the photo it actually looks black. I did embellish with some Nuvo Drops.